When Irma Arrived, Most Florida Health Care Facilities Were Ready : Shots - Health News Eight deaths at a Florida nursing home got a lot of media attention. But a tour of other health care centers in the Miami area found mostly good care after Hurricane Irma struck. 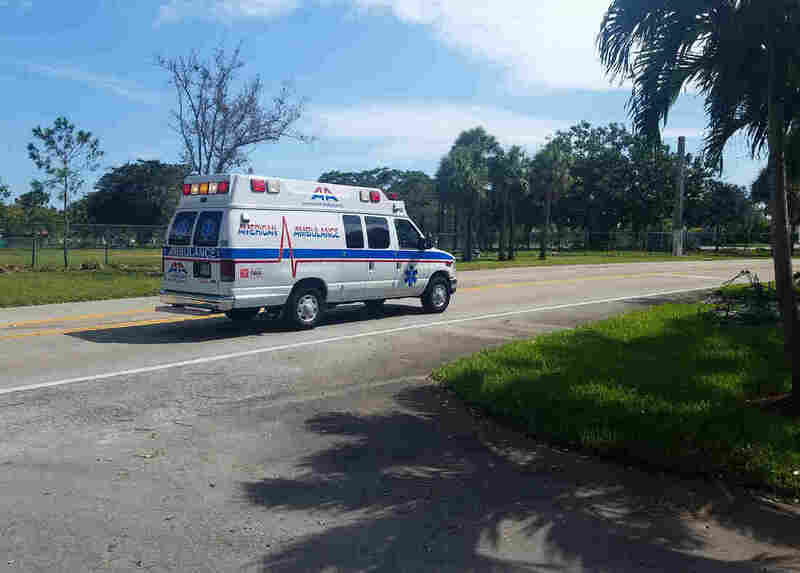 One of many medical vans heads to the Rehabilitation Center at Hollywood Hills in south Florida to evacuate patients last week after a power outage. Another hurricane, another health care horror story. At least that's how it looked when eight patients died at a nursing home in Hollywood, Florida. The facility lost its air conditioning several days after Hurricane Irma struck. That event conjured memories of the scores of elderly who died in Louisiana hospitals and nursing homes following Hurricane Katrina in 2005. But it would be misleading to attribute the Florida deaths primarily to Irma. And it would be a mistake to assume that most other health care facilities in southern Florida were unprepared for a hurricane. Here's what I saw as a reporter who covered the Florida nursing home deaths, but also visited Miami-area hospitals, clinics, shelters for people with medical problems, and even the area's largest dialysis center. Yes, it experienced a partial loss of power after Irma. But the real problem appeared to be that the staff didn't act quickly enough after the air conditioning failed and patients became overheated and dehydrated, according to police, emergency responders, and family members of patients. By the time emergency responders got there, the facility's second floor was "extremely hot," some patients were already dead, and others were near death, Hollywood Police Chief Tom Sanchez told reporters. When the hospital finally learned what was happening, dozens of workers rushed over to help, says Randy Katz, an Emergency Medicine specialist at Memorial. It's worth noting that the nursing home deaths are being investigated as a potential manslaughter case, not a sad consequence of Hurricane Irma. Meanwhile, other health care facilities in Florida did pretty well after the hurricane. Just 10 of the state's more than 300 hospitals were closed by the storm. But 150 of the state's 700 nursing homes still lacked full power three days after Irma struck, according to the Florida Health Care Association, which represents nursing homes. Most had backup generators, though, the group says. Meanwhile, the Miami area's largest dialysis center was able to reopen just hours after the winds began to die. "We knew we had generator backup and we knew it was a safe location on the fifth floor," says Sandra Sol, a social worker at the DaVita Miami Campus dialysis center near downtown Miami. So DaVita diverted hundreds of dialysis patients from other centers to this one. The decision was critical because dialysis patients usually need treatment several times a week to prevent toxins and fluid from building up in their bodies. When I visited the dialysis center two days after Irma swept through, the pace was frenetic. All 36 dialysis chairs were filled. One contained Miguel Lobera, 51, a cheerful, energetic man who has been on dialysis for four years. "A day after the storm I called my tech and he says come tomorrow at the regular time," Lobera tells me. Like a lot of dialysis patients, Lobera has a range of illnesses in addition to kidney disease. "I'm an encyclopedia of health problems," he says. "Diabetes since I was a little kid, stroke, neuropathy, a heart attack or two." "These people are the best," Lobera says. "They take care of my health. I have truly been blessed when it comes to medicine." Irma did make it hard for some patients to get to the dialysis center, Sol says. "We had a few patients that came short of breath. But as soon as you get them on that machine and start pulling that fluid out, they start feeling a lot better." DaVita had planned ahead. When the Miami Campus center realized that hurricane weather would start arriving in the area Saturday, it asked patients scheduled for visits that day to come on Friday instead, Sol says. And staff had already been stockpiling supplies in anticipation of huge demand after the storm. The planning paid off. "So far everything has gone very smoothly," she says. Thousands of patients with other medical problems were taken to more than 90 "special needs" shelters around the state, according to the Florida Division of Emergency Management. I visited one of these shelters, on the first floor of an office building at Florida International University. It featured more than 100 cots set up as makeshift hospital beds, 24-hour nursing, and doctors on call. "I couldn't ask for anything better," says Barbara Strong, a patient there. Strong is frail and has balance problems, though she is quick to point out she is "off balance physically, not mentally." "It's very comfortable, we get three meals a day, and the nurses are excellent," Strong says. The special needs center at FIU was caring for "diabetics, amputees, heart patients, and people that are on oxygen," Strong says. Across campus at the general shelter, which housed several hundred residents at its peak, people with medical needs give mixed reviews. "I went to the hospital twice already," says Sabrina Dupont, who is 35 weeks pregnant and lives in Key West. "They got me right in and out," she says. But Jessica Dawn, a transgender woman with diabetes from Key West, said the shelter didn't provide healthful food or a place to refrigerate her medications. "I haven't been on my testosterone blockers for five days now," she says. A tour of Miami-area health care facilities found some closed, but many others open. Several community health centers were locked and appeared not to have power. And the offices of several home health care companies were closed during regular business hours. But every hospital appeared to have power and a working emergency room.